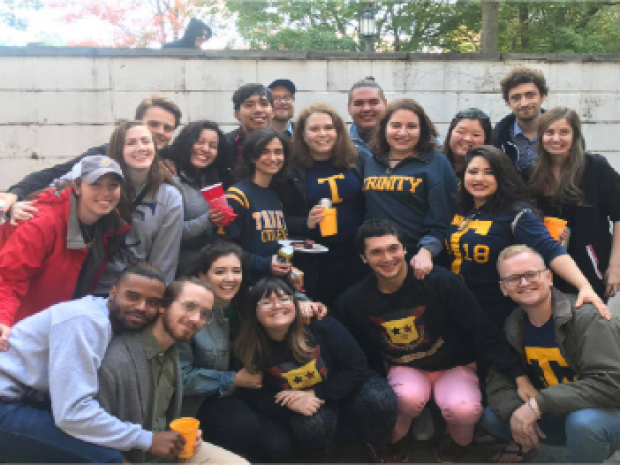 Trinity College held its annual homecoming celebration from Friday, Oct. 12 to Sunday, Oct. 14. This year’s homecoming, which included games by Women’s Volleyball, Field Hockey, Men’s Soccer, Women’s Soccer, and the annual Homecoming Football Game against Tufts. This year’s homecoming was also considerably earlier than previous years, when the event was held in November, to offer better weather and more opportunities for alumni to witness Trinity’s many fall sports. Director of Alumni Relations Stephen Donovan spoke with the Tripod and stated that he was “delighted to see so many alumni, parents, and friends come back for Homecoming Weekend.” This year’s weekend kicked-off with tours of campus and a return to the classroom for alumni, who were invited to sit in on current classes. Later that evening, the Half-Century Club held a reception and its annual “Pass the Baton” dinner, where the Class of 1968 offered its best wishes to the Class of 1969 in preparation for their 50th Reunion this summer. This dinner included retired faculty and their wives, alumni from the Class of 1969 and earlier, as well as SGA student representatives. The Class of 1963 also held their annual reception and welcome dinner Friday evening. Saturday, alumni, families, and current students held tailgates in the Hanson parking lot and fraternities were abuzz with imbibed alumni celebrating their love of Trinity with current students. The football game began with an American Flag Ceremony that included military veterans and their guests as well as Reunion 2018 and Reunion 2019 committee members. At 1:30 p.m., the Homecoming Football Game began against Tufts. Trinity won the game 38-24. Saturday afternoon and evening included a presentation on Chapel restoration in light of an upcoming capital campaign, a celebration of the Trinity Pipe’s 80th anniversary, and a reception and dinner where the Class of 1963 scholar awardees were recognized for their achievements. On Sunday, the agenda included a brunch, Service of Holy Communion in Trinity’s Episcopal chapter, and Roman Catholic mass, as well as several sporting events including Women’s Soccer, Men’s Soccer, and the Men’s Alumni Soccer game. Donovan noted his pleasure and gratitude for having been “able to work together with so many student organizations, including the SGA, IGC, multicultural organizations, and athletic teams to create events that allowed for students and alumni to come together as a community to network and learn from each other.” With Homecoming Weekend having concluded, the next major college event is Parent’s Weekend for current students, which will occur Friday, Oct. 26 through Sunday, Oct. 28.